Shawn Gourley is in the final process of her book being edited, The War at Home, which she shares on her site, Military With PTSD, and is allowing us to share her stories and experiences on our blog. Her husband, Justin, battles the demons of PTSD on a daily basis. Shawn is an advocate for PTSD and has stood beside her husband through the best days and through the worst. Right now I am so mad I could just spit nails. This may sound crude or even selfish, but right now I don't care. For seven years I have been fighting. I have fought with the VA to get my husband help. I had to fight with my husband to even get him to accept the help. I have had to fight to protect my children from the effects of their dad's PTSD. I am sick and tired of fighting. I love Justin. 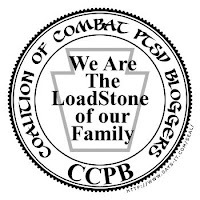 I hate PTSD, and I hate what PTSD has done to our family. Over the last 2 years, we have tried different medicines and talk therapy, which helped up to a point but didn't go nearly far enough. We are doing so much better, but we still have our bad days. Today was a very bad day. I called the new VA's National Caregiver Support Line, which provides assistance for caregivers of vets, thinking there would be someone I could talk to who would listen to me vent. No, it wasn't like that at all. They wanted to know if I was in any type of support group and if I had filled out the caregiver application form. When I answered, "No," to both questions, they said they would first give my information to the local Caregiver Support Coordinator in our area who would get in contact with me within two days. Are you kidding me? I need someone to talk to NOW, just someone to listen to me so I don't walk out the door today out of frustration. She continued by telling me this coordinator would help get me into a support group that will teach me things like what not to do or say that might set off the veteran. That's just great. I am already walking on eggshells so I won't set him off, but instead of focusing on helping the veteran learn how to deal, let's just make the spouses feel like it is what they are doing or not doing that is causing the veteran to react in a bad way. Then the operator told me about the caregiver application. She said it would give a little bit of funding to the caregiver, but she stressed that it wasn't a lot of money. She said it was, "Just our little way of saying thank you for standing by our veterans." I don't need to be paid to stand by my husband! Why can't they realize that what we really need is good help for the veterans? I have bad days, and there is not a person in the world I can turn to or get any type of encouragement from who has official power to help me. All I have are people who can provide sympathy and support, but no real solutions because they aren't authorized to do that. I went to hell and back because of my husband's PTSD. My kids can't even be kids because it might set their dad off. I am sick and tired of being torn between protecting my kids and helping my husband. It's not Justin's fault, but it sure as hell isn't our fault either. My husband isn't sitting back going, "Oh I have PTSD, poor me" He wants help, and no one will give it to him. He isn't trying to make excuses for his angry outbursts or blame it on others. But yet, the kids and I are the ones who have to live with it every single day. I have learned to tune it out and not take it personal, but my kids, being only 5 and 6, don't have those skills yet. But the only way I did learn to not take it personally was to numb myself. My heart is hardened because of it. It's made our lives liveable and mostly routine, but no matter what, I always will have a bad day here and there. And when those bad days do come, I am left alone and now being told I need some support to teach me how not to upset the veteran, nothing about how to get him to care for himself, nothing about how to care for my own sanity, and no mention of the kids. Can I not be happy or be my own person? I dream about those days but know they may never come. I dream that I am allowed to have bad days and have it be okay. Just one damn day! But no, I have to continue to fight for my family to hold them together. Everything falls on me being the glue that sticks. That is why some days I just want to give up. Not because I don't love my husband or because I blame him for any of this, but just because I am so damn sick and tired of fighting. And I am beyond sick of not having the kind of support I feel our VA should be providing for these veterans who have been through hell in the name of our freedoms. Thank you for posting this... you took my problems/issues/being stuck between a rock and a hard place and wanting to just scream and run away and put it into words. I also love my husband and want what's best for him, but sometimes I just need a break. Sometimes I just want things to be the way they were and I know that will never happen again. It's not only the PTSD, but the after effects of the brain damage he has from two TBIs. The after effects that even now, 5 years later, doctors still either don't want to deal with, or have no idea what to do. We found out yesterday that two of his cranial nerves are damaged. Something none of those so called professionals ever came up with. One of the nerves is just now showing damage, and the other one we stumbled upon ourselves last night and it explains SO MUCH MORE. The one that causes "unexplained reactions to brain damage" The one that NO ONE even thought about checking out. After five years of wondering WTF is going on. I really identify with the idea that the spouse is not some unbreakable caretaker. My husband is a Vietnam vet with PTSD; we've been married for over thirty years. We didn't know anything about PTSD until the time of the First Gulf War when he began to have obvious problems and he got counseling. As I learned more about PTSD I realized where Mr. Hyde, who started showing up soon after our marriage, must have come from. These days I don't see much of Dr. Jekyl. Mr. Hyde is in the ascendancy. My husband's PTSD symptoms have gotten worse and worse ever since the current wars started. My husband's behavior has actually gotten pretty weird these days. I don't know if it's severe PTSD or if he's starting to get some kind of dementia along with the PTSD. At any rate it has gotten to the point where I feel like I'm living in a disaster area all the time. It's hard to do normal activities. I feel too stressed and unsure of things to feel like doing much. I feel as if my life is stuck. It can't move forward when the person who is supposed to be my partner is in such a bad way. It is very hard dealing with this. I feel very alone. It really doesn't seem as if the counseling my husband gets teaches him ways to keep from behaving too much like he is in a war zone. Instead he seems to think reasons for behaviors are justifications for not trying to change them. It seems as if the VA has decided that the solution to the PTSD problem is just make the spouses be caretakers, instead of trying to make anything better. Some men just won't talk through the issues with anyone and to try and get help through the Veterans Admin is probably not going to work for you, I or anyone else in a short term crisis, yet in it for a very long term. The government is just a bureaucratic demon in disguise. Ill equipped, improperly trained, and just down right nasty at times. I find that if your close friends and family can help you they will. I also find comfort in seeking God's word for short term and long term help. I know that I have a lot of issues personally and find it hard to discuss as the general public just cannot believe that people in the military are physically and emotionally tormented by the actions of themselves and others. I pray you do seek the help of friends, family, but most of all the Lord.